Credits to AArrow Korea for the epic fan art of our champion! 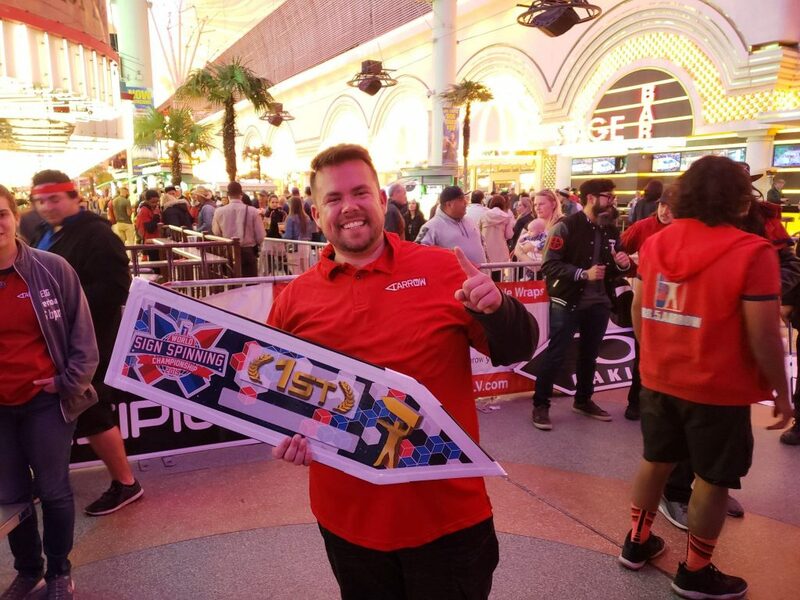 Las Vegas, NV – On January 18th and 19th of 2019 the best sign spinner’s from around the globe gathered in Las Vegas for the 12th annual World Sign Spinning Championships! Competitors traveled from as far as South Korea and Germany to showcase their skills, each hoping to become the next World Sign Spinning Champion. Hundreds of competitors became dozens after battling it out in each round. 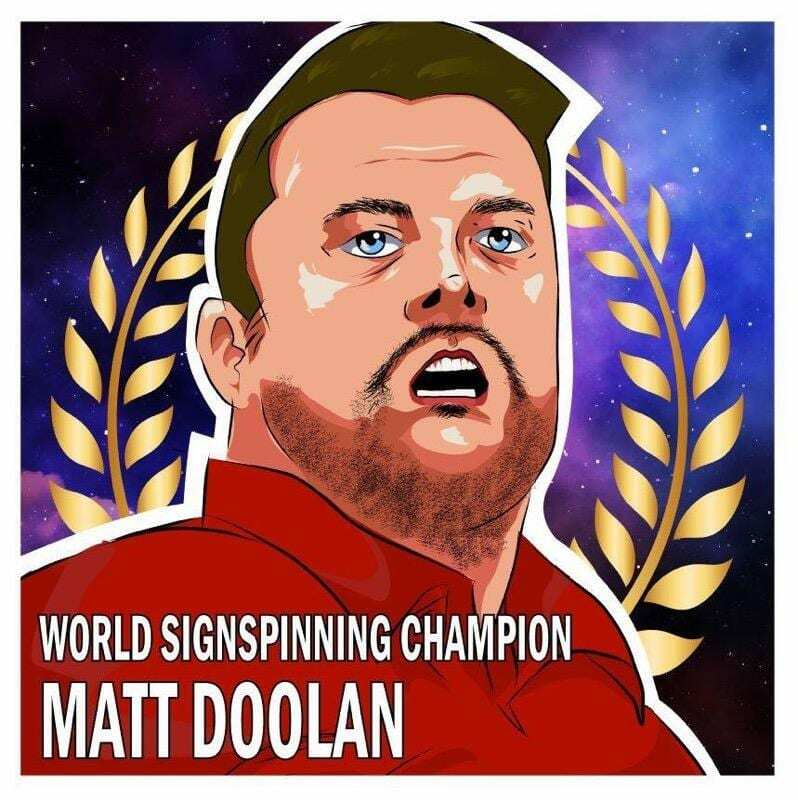 After coasting through the first 2 rounds, Sign Spinning Legend Matthew “Crunchy” Doolan found himself in prime position to take the crown back home to Dallas Texas! The face of a champion, everyone brought their best tricks but Matt Doolan wasn’t playing any games this year. The final round came down to just 11 of the best sign spinners from all over the world, all brimming with more talent than the next. This year was the toughest sign spinning competition for any challenger; but Matthew Doolan is a veritable walking tricktionary, having an arsenal of tricks from all era’s of sign spinning. 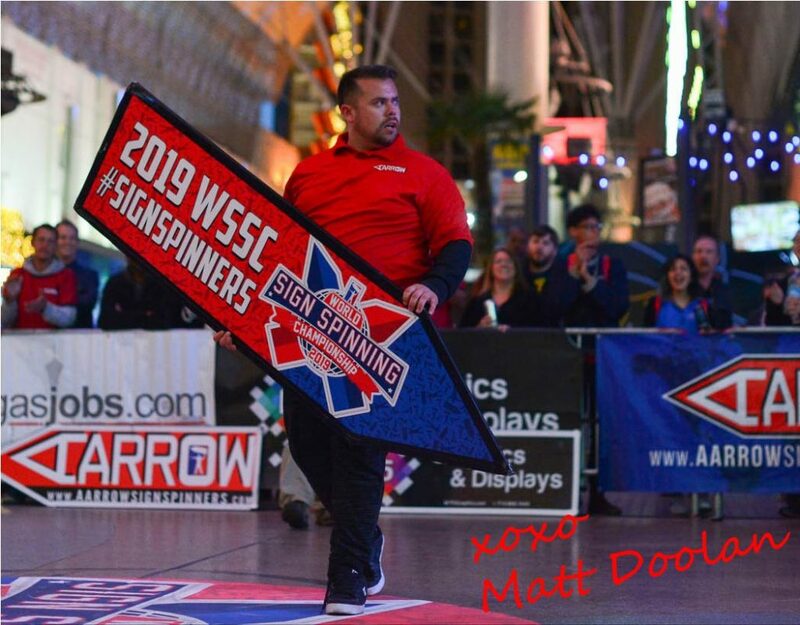 In the final round, the difference between he and all the competitors was obvious as Matthew’s legendary skills came to life on Fremont Street – mind blowing signature move after signature move was unleashed on the competition. Doolan’s victory was clearly undeniable and was one of the easiest calls the judges had made in years! Matt showing off his 1st place trophy after destroying the final round! Lookin’ good Matt! Doolan, 29 and father of 3 has been the focus of a number viral sign spinning videos as well as featured in the band 311’s “Hey You!” music video. His favorite trick is the cleverly named SmeakerDickelMcFinalHeimerstein and his favorite pizza is the classic Pepperoni and Jalepeno. He has come close to the championship title in years prior but never quite pulled in front, until this year – taking home 5000 dollars, the championship trophy sign and a year’s worth of bragging rights. Congrats Crunchy on a Victory well deserved! Click here to check out more from Matt Doolan! One on One with Matt, check out the legend make magic!